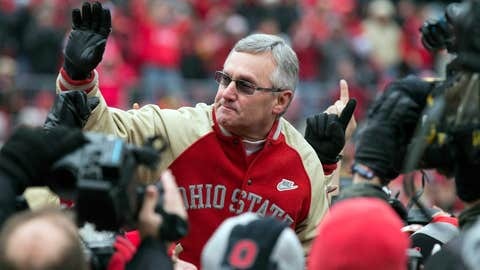 November 24, 2012; Columbus, OH, USA; Ohio State Buckeyes former coach Jim Tressel is held by players from his 2002 National Championship team in a game against the Michigan Wolverines at Ohio Stadium. When you think ’90s hip-hop, Jim Tressel’s name isn’t the first that comes to mind. Tressel has used the #QuietTime before, perhaps a nod to the 10 minutes before meetings or the start of practices where he would suggest solitude. Whether Tupac has factored into the equation before is uncertain. Tressel may not be west coast when it comes to the universities at which he’s worked but when rap is involved we see his true colors.